October 9, 2010 – Malibu, California: Malibu Surfrider Beach is enshrined as the first World Surfing Reserve. Kicked off with a moving sunrise blessing led by Chumash leader Mati Waya and a paddle-out ceremony by about a hundred surfers on their boards, Malibu’s legendary Surfrider Beach was enshrined on Saturday as the first World Surfing Reserve. This designation establishes and celebrates the unique value of the Malibu coastal environment and aims to enhance efforts to maintain the pristine nature of the area for future generations. As the wording of a resolution adopted by the Board of Supervisors of the County of Los Angeles states, in part, Malibu was chosen for the honor because of the stellar quality of its waves, the seminal role it played in the birth of modern surf culture, the rich biological characteristics of its surrounding area, and the strong community support of the area. Already the world’s most famous surfing beach, the WSR designation cements Malibu’s significance for what has become a global tribe of millions of surfers and hundreds of millions of ocean lovers. The name Malibu is an anglicized version of the original Chumash village, which occupied the area for hundreds or thousands of years prior to European contact in the 16th century. The Chumash were an ocean-oriented people, and there has been speculation that they may have ridden the waves here in their small tomol fishing canoes. A local Chumash leader and founder of the Wishtoyo Foundation, Mati Waiya’s traditional sunrise ceremony honored and blessed the day’s activities. The subsequent paddle-out and surfer circle in the water at First Point was led by the Local Stewardship Council of the new Malibu World Surfing Reserve. World Surfing Reserves is a program founded by Save The Waves Coalition, a nonprofit organization dedicated to preserving and protecting surfing areas throughout the world. The program has been substantially influenced by National Surfing Reserves Australia, which has already dedicated eleven beaches as National Surfing Reserves. The WSR initiative is also recognized and supported by the International Surfing Association, which is recognized in turn by the International Olympic Committee. The Malibu World Surfing Reserve is endorsed by the California Coastal Commission, Los Angeles County, and the City of Malibu, as well as local nonprofits – Surfrider Foundation West LA/Malibu, Santa Monica Baykeeper, and Heal the Bay, among others. 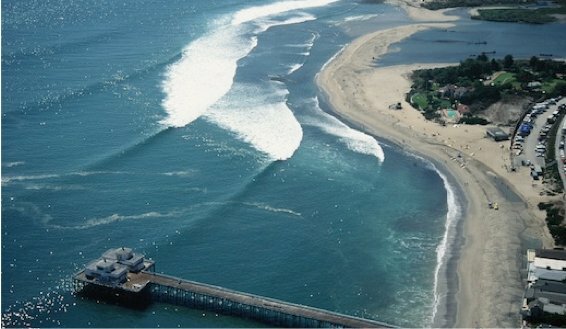 It is anticipated that Malibu is the first of what will become a global network of World Surfing Reserves. Other nominees include Waikiki Beach in Hawaii, Manly Beach in Australia, Jeffreys Bay in South Africa, Fernando de Noronha in Brazil, and dozens more. – Drew Kampion reporting from Malibu.